Ernie Knight Oval was named in 1995 in recognition of his efforts in the establishment and maintenance of parks, reserves and sporting grounds in Gilgandra for over 30 years. The wall was designed and erected by members of the Knight family in 1996. 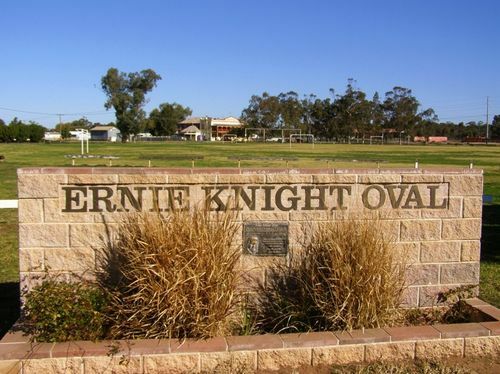 This oval was renamed "Ernie Knight Oval" in November 1995 in recognition of his efforts in the establishment and maintenance of parks, reserves and sporting grounds in Gilgandra over 30 years. This wall was designed and erected by the Knight family in memory of Ernie Knight a loving husband, father and grandfather.